Good Morning! 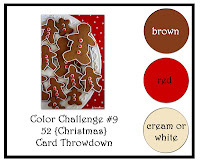 This week's 52 Christmas Card Throwdown challenge is a color challenge. This is an awesome color challenge this week so I hope you'll join us and play along. The colors are: brown, red, and cream or white. I began making my card by stamping the dasher image, and by the way, I love this image! Then I layered my image onto chocolate chip card stock and I added some glitter on the antlers. My real red layer was dry embossed using my final press embossing folder and my big shot. My scallop chocolate chip border was created using the adorning accents edgelits and just along the bottom of my card I decided to add two rows of paper piercing. Along the top left side of my card I added three small silver brads and then to finish off my card I added my sentiment. To create the bottom chocolate chip layer under my sentiment I punched out 2 punches using some chocolate chip card stock and my decorative label punch. Then I cut one of the punch outs in half vertically and the other one was cut in half horizontally and all I did was to adhere them behind my real red layer leaving just enough room around the egdes so that I would have a nice chocolate chip border. The back side of my sentiment it is pieced together, but no one will see the back side so that's okay. To adhere my sentiment onto my card I used two dimensionals on the left side. I didn't need to use any dimensionals underneath the right side of my sentiment since it was pretty level with the layered dasher image. I loved this color combo so much that I decided to make another card. I stamped my image and colored it using my SU markers. My image is layered using the label collection framelits dies. I used the same size die for the image layer and the real red and second white layer. The red layer is just turned sideways and the white layer I cut in half and placed behind my red layer. The brown layer is the next bigger size and it's also dry embossed. My sentiment is also made up of a few layers. My sentiment is cut out with the smallest size framelits die and then it's layered onto 1 modern label punch (it is also cut in half and then spread apart to create the layer) and then that is layered onto a chocolate chip decorative label punch. I added a small silver brad on each end of the modern label punch. The designer series paper I used is from the same sheet. I used the polka dot side in the center of my card and on the back side of the same sheet of dsp is the circle pattern. I sometimes try to use the same dsp or papers from the same pack. It makes matching up the colors so easy. I have dimensionals behind my sentiment and I decided to add some ribbon onto my card. If you can, be sure to take some time and visit the other 52 Christams Card Throwdown design team members' cards. They are wonderful this week! Have a great day! 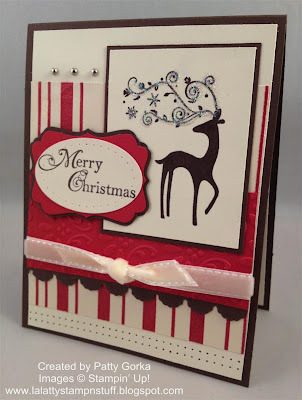 Hi Patty - Dasher is one of my favorite stamps too and I love how you glittered the antlers! Both cards are just lovely!! I just love both of your cards they are so STUNNING!! Beautiful work on these! I finished my 100 cards challenge yesterday, so I'm taking the tour to see where everyone else is :) Great cards - that color combination works so well together. The reindeer is my favorite, but only because that is one of my favorite images. Good luck on your final push! Again... your cards are the neatest!!!. BEAUTIFUL CHRISTMAS CARDS PATTY!!!. Gorgeous cards! I love these colors together. Your designs are fabulous. Absolutely gorgeous Christmas cards using these lovely colours Patty. Wow! I LOVE these colors, the layouts....everything Patty! Excellent work Hun & TFS!!! Both are beautiful cards Patty, fabulous layouts on both! Love Dasher's sparkling antlers! these are both amazing!!!! LOVE the reindeer and how you've layered your sentiment.might help me when design Gift Card envelopes.